On April 9, 2019, we will be holding our 9th Annual Celebration of Achievement Banquet at Merrimack Golf Course 210 Howe St. Methuen MA We will be honoring both a Teacher of the Year and a Student of the Year from the Methuen Public School System and Presentation of Mary Academy, as well as award college scholarships to high school seniors who reside in Methuen and attend Methuen High School, Presentation of Mary Academy or Central Catholic High School. 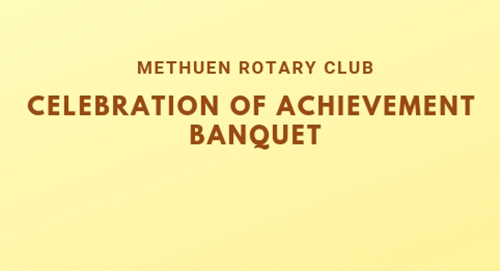 In addition, the Club will present its “Service Above Self” Award, honoring an outstanding individual who has made a significant contribution in the Methuen Community and most exemplifies the Rotary ideal of “Service Above Self. Our Special guest speaker is Larry Giordano founder of Merrimack Valley Foster Kids. For tickets please visit https://rotaryclubofmethuen.ticketleap.com/admin/events/celebration-of-achievement or contact Trudy Lawler.